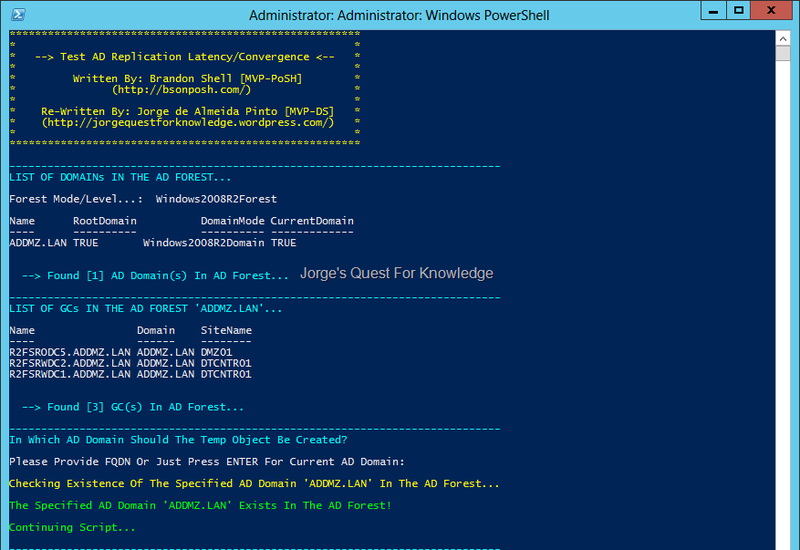 (2013-03-02) Testing Active Directory Replication Latency/Convergence Through PowerShell « Jorge's Quest For Knowledge! UPDATE: The latest version of the script can be found here. 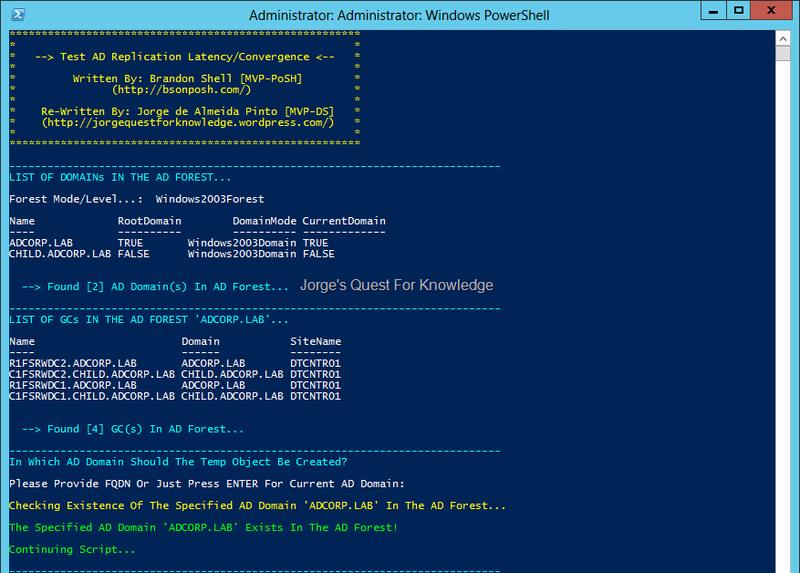 About two years ago I wrote AD replication latency/convergence test script that can be found in this blog post. When the script enumerates all directory servers the object replicates to, it will test the connection to each an every directory server. For DCs in the same AD domain that will be through port TCP:389 and for GCs in other AD domain that will be through port TCP:3268. If the directory server is reachable over the required port it will mark the DC/GC as such and the same applies if the directory server is not reachable because of routing issues or firewalls. The latter is important as the script then does not keep trying to reach those DCs/GCs while they are no reachable. To use the script just copy the contents of the table below and put that in a script that could be called "Check-AD-Replication-Latency-Convergence.ps1", but this is of course not mandatory. In the explanations and examples I will use this name. Note that this script is not signed in any way by me, so you might need to adjust the PowerShell Execution Policy of the server where you want to execute this script. It is not possible to pass credentials through the script, so the account you are using to execute the script should have the correct permissions to create (and delete afterwards) the temporary object in the specific container in some AD domain (default used is ‘CN=Users,DC=<DOMAIN>,DC=<TLD>’) or you should execute the script from a PowerShell console window that was started with credentials that do have the correct permissions. In addition, the server where this script is executed must be able to access every DC (RWDC and RODC) in the same AD domain through LDAP (port 389) and all GCs in other AD domains through LDAP-GC (port 3268). So if your network is not fully routed or you have firewalls deployed between directory servers, and those directory servers are therefore not reachable, they will be marked as not reachable. This prevents the script from trying to contact the directory servers while it is not possible. Last but not least, I just tested this script in a single AD domain AD forest with a few DCs (RWDCs and RODCs) and in a multiple AD domain AD forest, also with a few DCs. So I do not know how well this is going to perform in an environment with a lot of DCs. If you are going to use this script, the only thing I would like to ask you is to give me feedback about it and your experiences. Thanks! REMARK: In either case the AD domain will be checked if it exists in the AD forest. If it exists, the script continues and if it does not exist, the script aborts. 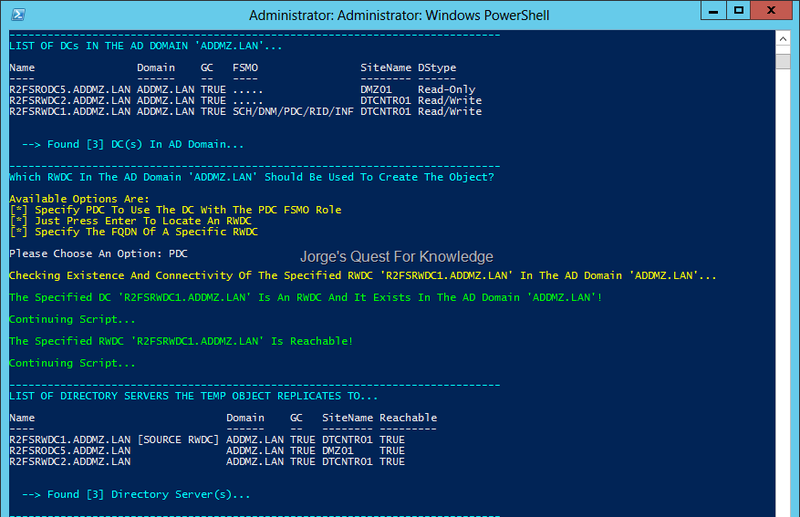 REMARK: In all cases the DC specified will be checked if it exists in the AD domain and if it is an RWDC and not an RODC. If it exists and it is an RWDC, the script continues and if it does not exist or if it is an RODC, the script aborts. The code of the PowerShell script that does this is included below. Screen dumps are also included after the code sample. I have also linked a file with the contents below to this blog post. Get the most up-to-date version HERE. This script is furnished "as is". No warranty is expressed or implied! Always test first in lab environment to see if it meets your needs! Use this script at your own risk! I have tried to check everything that needed to be checked, but I do not guarantee the script does not have bugs. I do not guarantee the script will not damage or destroy your system(s), environment or whatever. I do not accept liability in any way if you screw up, use the script wrong or in any other way where damage is caused to your environment/systems! If you do not accept these terms do not use the script and delete it immediately! # Determine Which AD Domain To Use For The Temp Object. This Does Assume The Correct Permissions In That AD Domain To Create/Delete The Object! $ADDomainToWriteTo = Read-Host "Please Provide FQDN Or Just Press ENTER For Current AD Domain"
$SourceRWDCInADDomain = Read-Host "Please Choose An Option"
In this case ALL directory servers are reachable without any problems! I just pressed ENTER to use the current AD domain. 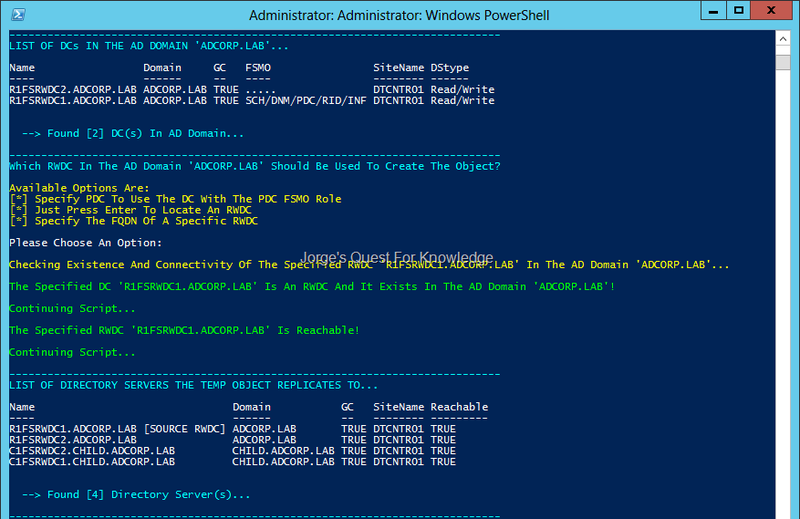 If a DC is marked green, then the temporary AD object has replicated to it and the script found the temporary AD object. If a DC is marked red, then the temporary AD object has not yet replicated to it OR the DC/GC has been marked as unreachable. When finished it shows the start time, the end time and the duration of time before the temporary AD object reached all directory servers. It also removed the temporary AD object again to keep stuff clean. This is a W2K12 AD forest/domain that has change notification enabled on all AD site links. So after a change has occurred on a certain RWDC it will notify the very first replication partner after 15 seconds (=default) and each other replication partner with pauses of 3 seconds (=default). About 3 seconds later, RWDC ‘R2FSRWDC1.ADDMZ.LAN’ notified RODC ‘R2FSRODC5.ADDMZ.LAN’ and RODC ‘R2FSRODC5.ADDMZ.LAN’ inbound replicated the temporary AD object from RWDC ‘R2FSRWDC1.ADDMZ.LAN’. In this case NOT ALL directory servers are reachable. The RODC is separated by a firewall from the RWDCs. 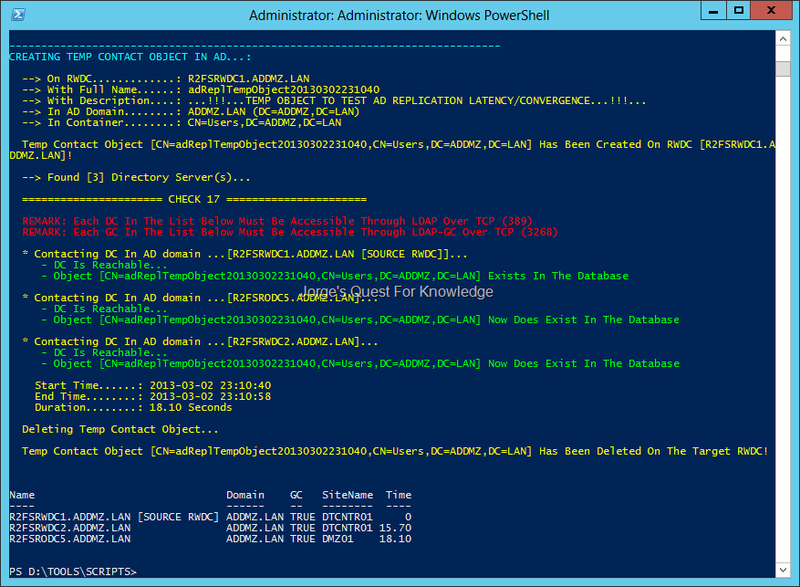 The RODC can communicate with both RWDCs, The RWDCs however cannot with the RODC, except for the RPC Endpoint Mapper port and the statically configured AD replication port for change notifications. For DCs that are not reachable, the domain name and the site name of the DC might not always be specified n the table. I chose for the script to find an RWDC as the target RWDC to write the temp object to. NOTE the reachability of the RODC! MOST LIKELY, about 3 seconds later, RWDC ‘R2FSRWDC1.ADDMZ.LAN’ notified RODC ‘R2FSRODC5.ADDMZ.LAN’ and RODC ‘R2FSRODC5.ADDMZ.LAN’ inbound replicated the temporary AD object from RWDC ‘R2FSRWDC1.ADDMZ.LAN’. However, the script is not able to check that because the firewall does not allow communications to the RODC! Because the RODC is not reachable, it is marked as “Fail” in the timing. I chose for the script to find an RWDC as the target RWDC to write the temp object to. 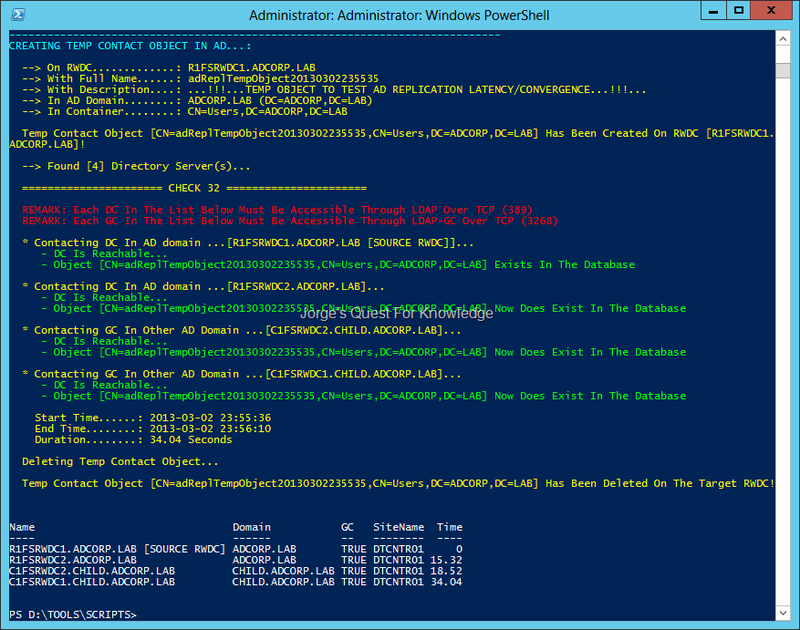 This entry was posted on 2013-03-02 at 23:45	and is filed under Active Directory Domain Services (ADDS), PowerShell, Replication, Tooling/Scripting. You can follow any responses to this entry through the RSS 2.0 feed. You can leave a response, or trackback from your own site. Really good job! Thank you for sharing! It works like a charm, does exactly what it says. I’ve been searching for quite some time for a powershell script that did this. I’ve used it on 2003 (x32) on through 2008 R2. It has worked perfectly. Wonderful job to both you and the original author. In a lab environment, we’re seeing all of the DCS enumerating as Read Only DCs, while the instanceType of all of them is still 0x4 (Write). Has anyone else seen this type of behavior, or possibly a way to correct it? Yes, awesome script, thank you very much! Great script. How do you stop the test but still display the results in case there’s a DC that is corrupted/can’t replicate to? can you send me screendumps of what you are seeing/experiencing to the mail address available through the contact page of my blog?